A famous British painter and a reputed engraver, Solomon Alexander Hart was born in the year 1806 in the month of April. 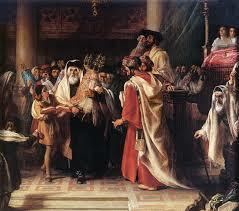 Solomon was also the very first Jewish associate or member of the prestigious Royal Academy in the city of London. He was considered the most influential Jewish artist of the 19th century based in England. Being born in the port city Plymouth to a Jewish engraver known as Samuel Hart. His father was also a Hebrew tutor. Solomon completed his basic education and was duly apprenticed to an engraver within his locality. Young Solomon Hart was given his education under the supervision of a Unitarian Minister He worked many years in the Royal Academy honing his skills practising engraving as well as various styles of sketching techniques. He practised genre, historical scenarios, and miniature sketches. In the year 1826, Solomon Hart gave his first début as an artist at the Somerset House Exhibition with a wondrous portrait of his sire. He was later accepted as a respectable member of the Royal Academy in the year 1840. In 1841, Solomon set off on a journey to Italy to study the land and as per historical records, wherein he spent nearly all his time in the city of Florence. The Italian journey happened on a Duke’s advice. Hart had made a portrait for the Duke of Sussex and it was exhibited during the month of May in the year 1840. His ambitious work known as ‘The Elevation of the Law’ was bought by Robert Vernon and later bequeathed to the country. This work bestowed him with great fame and honour. Hart was given almost seventeen commissions. Out of these commissions, he could manage to complete only three to four commissions. Some of them such as, ‘Nobility members being honoured the communion of the Church (Catholic)’ was largely appreciated by the people. He was given the status of a distinguished professor at the Royal Academy in the year 1854. Though his initial work arts leaned towards Jewish themes, Solomon was also influenced by the great Italian artworks of noted painters such as Domenico Ghirlandaio. Solomon Hart worked on several church motifs, monastery-related paintings, and illustrations for Jewish periodicals. Solomon did not marry as long as he was alive. Gradually the great painter slowly started losing his eyesight, although he worked and painted as long as he could even with failing eyesight problems. C.R. 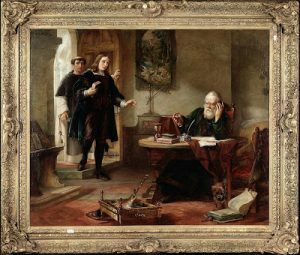 Leslie was succeeded by Solomon Hart in 1854 as the reputed professor of painting art at the Royal Academy. Hart was said to hold office until the year 1863. Advancing years saw the deterioration of his artworks and reputation. Hart was greatly remembered for his library work at the Royal Academy. The print ‘ A Catalogue of Books in the Library’ was well appreciated by the students as well as the Academy members. Hart was 76 years of age when he finally passed away in his London residence.